One of my new favorite blogs out there with some awesome recipe ideas. Get cooking guys! A must if you are a fan of the sweet and salty. With superfood kale, the flavors in this salad cannot be topped. Make sure ale is washed and dried, chopped into small bite size pieces with the tough ribs removed (they make for great juices so just freeze them). In a bowl, toss with balsamic and olive oil and season with salt and pepper. Massage the dressing into the leaves. Top with chicken, nectarines, pine nuts and cheese and toss. The salad marinates i the dressing and has great flavor after 10 hours of sitting in the fridge, A great make a night ahead for work the next morning kind of salad. 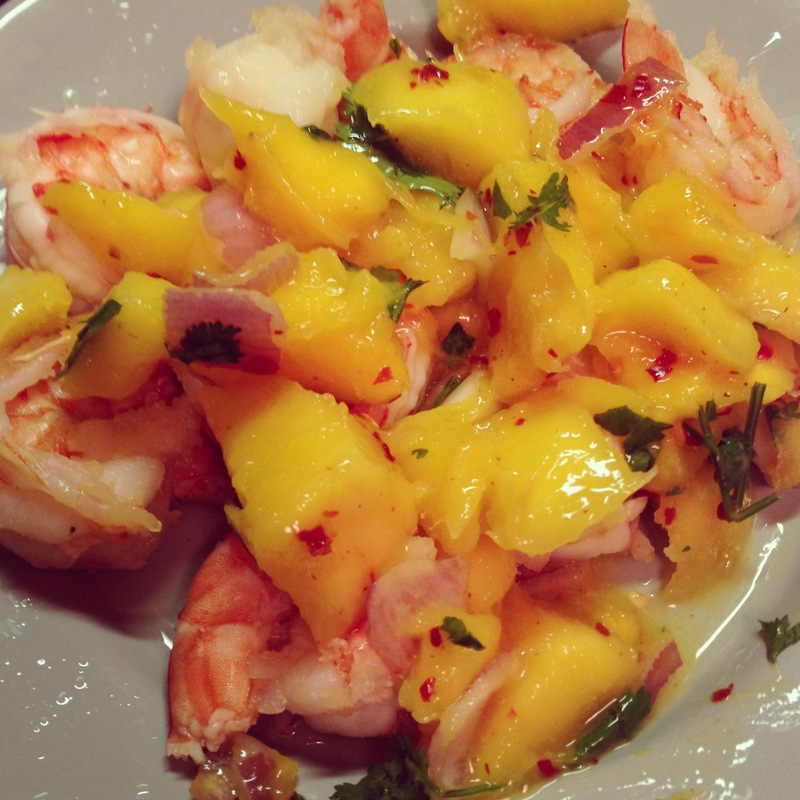 Steamed shrimp with a sweet and spicy mango salsa on top. An easy, light summer meal that is a pinch to put together. Would be great with some grilled shrimp too. Steam shrimp and set aside. I used a microwave steamer but you could use a bamboo one or whatever you have. In a separate bowl, add all ingredients except the lime juice. Top the mango salsa with lime juice and toss lightly. Serve with steamed shrimp. Trader Joe’s sells coconut oil in a can spray form. Needless to say it is now my go to spray item when it comes to cooking with oil. These beet chips are incredible. I ate two whole beets mindlessly even though it would be possible to eat more than that. These are incredibly easy with a mandolin slicer or a grater with a slicing attachment, which is what I have. It is no fancy thing, just a simple slicer I saw on sale at a Ross a couple years back. This is one of those tools that really give you value in your kitchen and since they are so inexpensive, I recommend picking up one that you will use through moves, through your twenties, through being a better cook. Even though I have only steadily been cooking for a couple months for myself, I have always had a deep love for all things edible. These were made on Sunday, my go to cooking day because usually time stops for me on a Sunday. I get maybe one day a week to sleep in and I usually choose Saturdays. This weekend is a different story though since I am upping up my yoga sessions and running for the 5k I have in June. I am not worried about the distance but it would be nice to run steadily. Running outside is a different matter and it takes some time for my knees to get used to concrete impact. I have a good friend’s early birthday on Friday so I will be spending some time at Franklin Mortgage and some other fabulous places in Philly, and the planner is filled to the brim with tasks to accomplish. I will be happy to breathe after these couple weeks are done and over with, which will be here faster than I know it. Here is the fabulous, easy recipe for you guys! Preheat oven to 350 degrees. Slice beets with a mandolin slicer or thin slicer for thin slicers (these cook the best and are the most crispy). Lay the thinly sliced beets in a layer on parchment paper in a baking pan or cookie sheet. 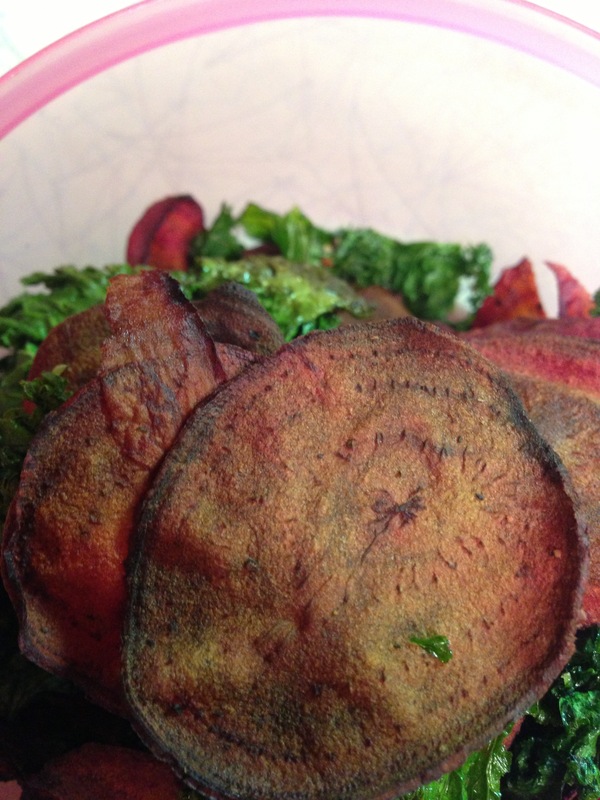 Lightly spray the beet chips with coconut oil or if you don’t have a spray lightly paint them with coconut oil. Top with pepper and salt and bake for 15 minutes or less depending on your oven. Keep an eye on these because they can burn easily! Silky garlic deliciousness. Mix it up in a glass jar and save it to use through the week on your salads or even on your proteins. Shake it all up and pour on your greens or protein. Why have I not discovered this earlier? The cloves are perfect and soft and sweet and incredible spread on everything from toast to crackers to dressings to marinades. I have made a dressing numerous times now with lemon juice, olive oil, salt and pepper, and garlic cloves mashed with a touch of mustard and some tablespoons of water. Preheat oven to 350 degrees. Peel the garlic bulbs. Cut the top part of the cloves so that the tops of the cloves show. Place on foil paper and top with seasoning and oil. 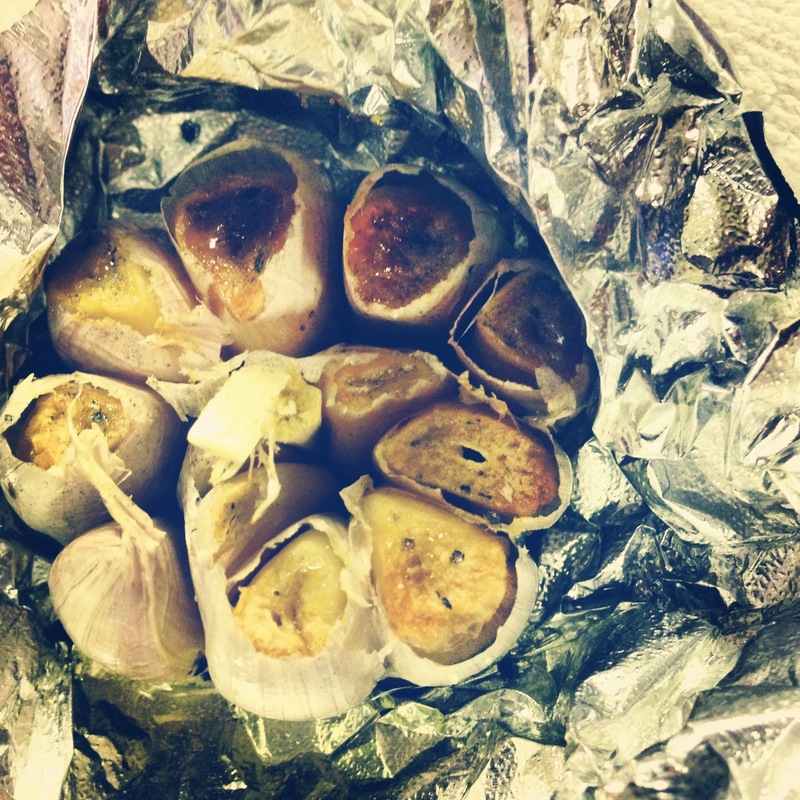 Wrap well with the foil paper and roast for 35 minutes or until the cloves are tender and soft. Saute brussel sprouts with the butter and spices until the outer leaves are golden brown, about six minutes on medium heat. 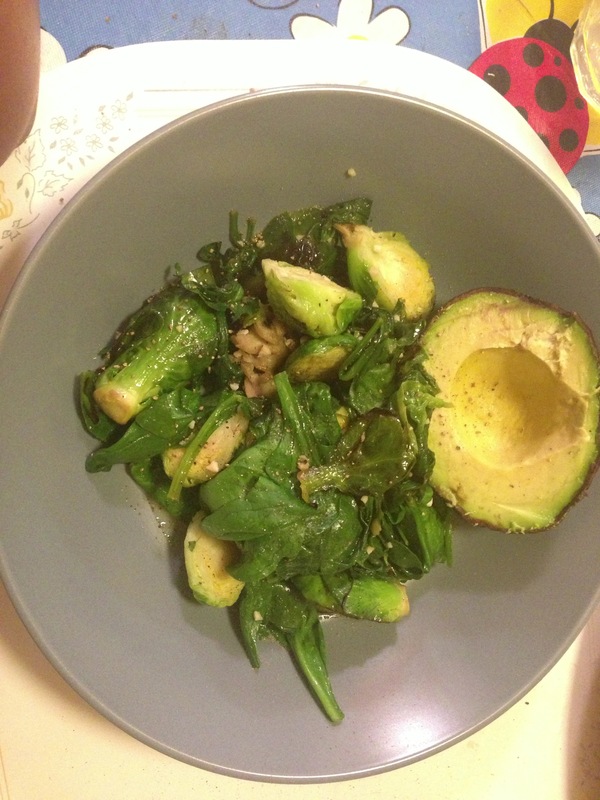 Serve with the avocado on the side or cubed and the lime, squeezed on top. Who doesn’t like grilled cheese sandwiches? This has a added health boost with avocado and tomato but you still get that delicious, comforting sandwich. Arrange all ingredients between your two pieces of bread. You can toast the bread previously for an added crunch. Spread the Earth Balance on the outside of the two bread slices and in a pan on low heat, press the sandwich down. Add a heavy dish or frying pan for the pressed panino feel or use a panini maker for the nice grill marks. Serve with a nice salad for lunch or dinner and continue loving your life. This is a green spring favorite, and since I am also a self diagnosed mushroom addict, I added those as well. Frittatas are a fabulous way to enjoy your veggies and get in a fabulous dose of spring for breakfast. I don’t usually make sweet breakfasts because I am more so a savory person in the morning, but breakfast food is so versatile to me. This is something that would be great paired with a fabulous side salad with massaged kale (balsamic, dijon and black pepper are great together) for a quick easy to reheat lunch (super work and school friendly). I love delicious meals that have some great nutritional power because who doesn’t love those meals that taste great and do great things for your body? With some green superstars like leeks, peas, asparagus, and mushrooms, you cannot go wrong. Get a gorgeous wedge for breakfast with some soothing mint tea, some coffee with cinnamon and some orange slices or some slices of toast if you want. Preheat oven to 350 degrees. Grease a baking dish, in your desired shape (round probably looks the prettiest). Spray the baking dish with PAM or coconut oil or olive oil. Whisk eggs and then add all ingredients except the cheese. Pour egg mixture into the baking dish and bake for 30 minutes or until the mixture has set. Keep an eye on this in case the edges brown quicker in your oven than mine. Preheat oven to 400 degrees. Mix Parmesan, salt, pepper, and greek yogurt in a shallow dish. In a separate dish, add whole wheat breadcrumbs. Dip the breasts into the wet mixture and then the breadcrumb mixture until evenly coated. Add to baking dish and bake for 25 minutes or until chicken is tender and juicy.